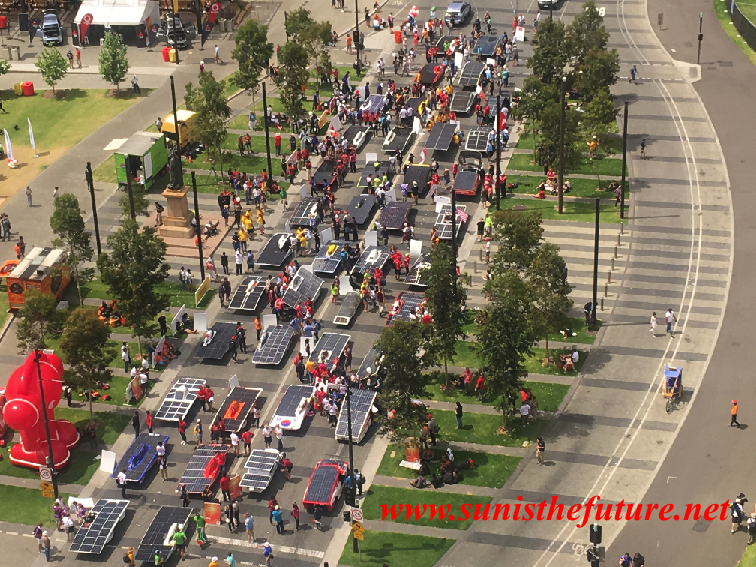 Glorious Day For Solar Cars Parade at Victoria Square of Adelaide, Australia (credit: sunisthefuture-Susan SUn Nunamaker). It is Sunday, Oct. 25, 2015 (Adelaide time) but Saturday, Oct. 24, 2015 in some parts of the world. 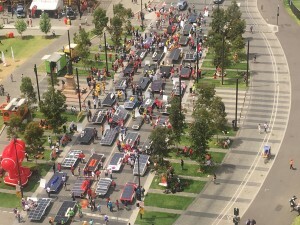 The Solar Car Parade of World Solar Challenge will start at 3:00 p.m. on Sunday, Oct. 25, 2015 (Adelaide time…although it is still Oct. 24, 2015 in some parts of the world), at Victoria Square of Adelaide, Australia. 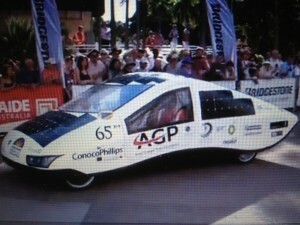 It’s a glorious day for Solar Car Parade and a glorious time for Solar Energy Future! Below is the video of the Solar Cars that came in on Saturday, Oct. 24, 2015. A great big applause for all of these teams, students, and supporters for their time, energy, and effort. It’s been a great learning opportunity for all of us! More will be posted and video uploaded later. 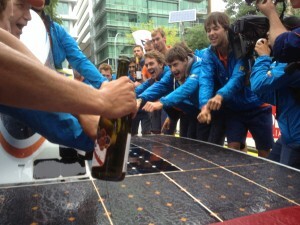 After having covered the World Solar Challenge for the third time/sixth year, I have to declare that the Dutch (from Netherlands) really know how to party and race solar cars! 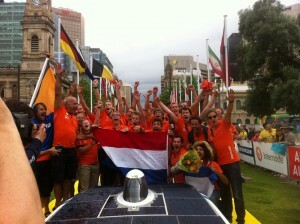 Not only are the first two places being occupied by the Dutch, Nuon Solar Team is coming in first this year and last time (2013).Their enthusiasm is infectious. Their energy level is uplifting. For centuries, the Dutch have had to deal with much of their endowed geographic position below the sea level. Such rigorous trials and tribulations may have contributed to their engineering prowess reflected in their design for solar cars. So goes the saying, “When life gives you lemons, make lemonade.” This year one person, Professor Wubbo Ockels, from the Nuon Solar Team, is conspicuously missing. After talking to the team members, I found out that Professor Ockels passed away in 2014. Professor Ockels, we hope that you are enjoying World Solar Challenge 2015 from up there, cheering and laughing with all of us. In his memory, I’d like to invite you all to view this post and visit www.happyenergy.com . It took a bit more time for Sun Is The Future team to upload this particular video above because we’re trying something new…a bit of time spent for learning curve. We want to make sure that all teams’ solar cars would be presented/included here. Hope you have or will enjoy this video above. Please feel free to share it with others. We have so far reached readers/viewers in 193 countries. We want every single nation on earth think about using solar energy! Help us to spread the Sunshine! We would also like to take this opportunity to share a terrific concept (–>Click), Value of Solar, succinctly explained by Karl Rabago. Value of Solar is the most cost effective and fair way for our world to transition into a sustainable future quickly. If you’d like to have a more in-depth understanding of Value of Solar, please also visit (–>Click) Expanded Discussion on Value of Solar and/or contact Karl Rabago at: karl@rabagoenergy.com. On Tuesday, Oct. 20, 2015, we’ve been informed that Red One of Solar Team Twente (Team #21 from Netherlands), is leading and the Nuna8 of Nuon Solar Team (Team #3 from Netherlands) are only separated by 2 kms ( Pretty amazing consider the fact that they’ve traveled 2,160 kms. 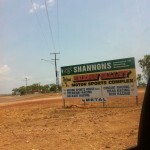 ), passing Alice Springs. 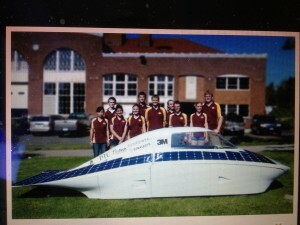 Then followed by Aurum of Univeristy of Michigan Solar Car Team (Team #2 from United States). There’s been alternating leading team, so it remains to be seen as to which team will be the first to arrive in Adelaide either tomorrow (Wed., Oct. 21, 2015) or the day after (Thurs., Oct. 22, 2015). 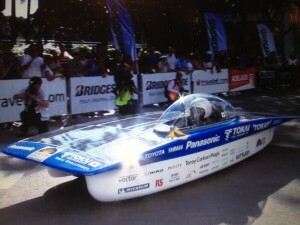 Besides the three leaders in the Challenger Class listed above, the leaders in Cruiser Class are: Owl of Kogakuin University (Team #88 from Japan), Stella Lux of Solar Team Eindhoven (Team #40 from Netherlands), and Sun Riser of HS Bochum SolarCar Team (Team #11 from Germany). 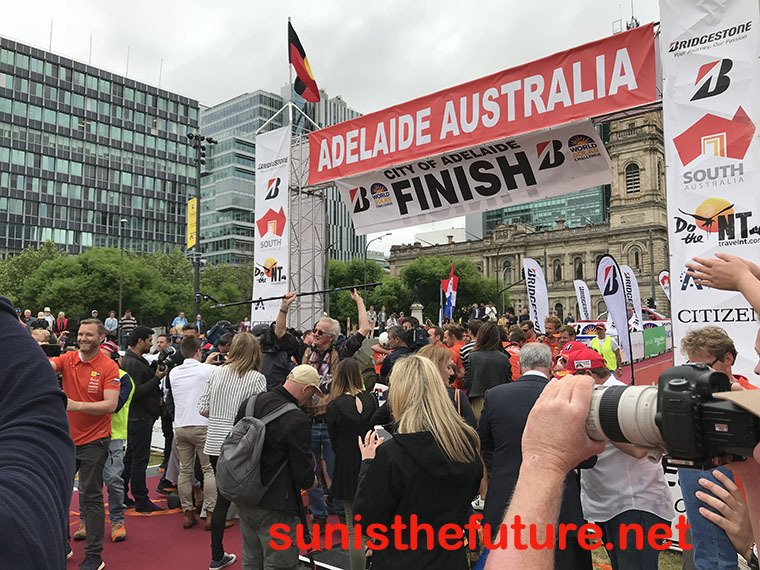 And the leaders of Adventure Class are: Sundancer of Houston Solar Race Team (Team #20 from United States), Solis Bellator of Liberty Solar Car Team (Team #34 from United States), and TAFE SA Solar Spirit of TAFE SA Solar Spirit (Team #42 from Australia). 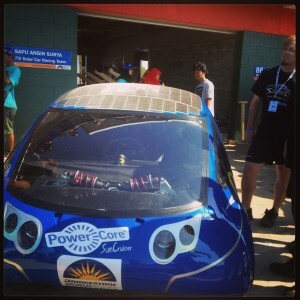 For a more complete list of all solar cars’ positions, please click HERE. 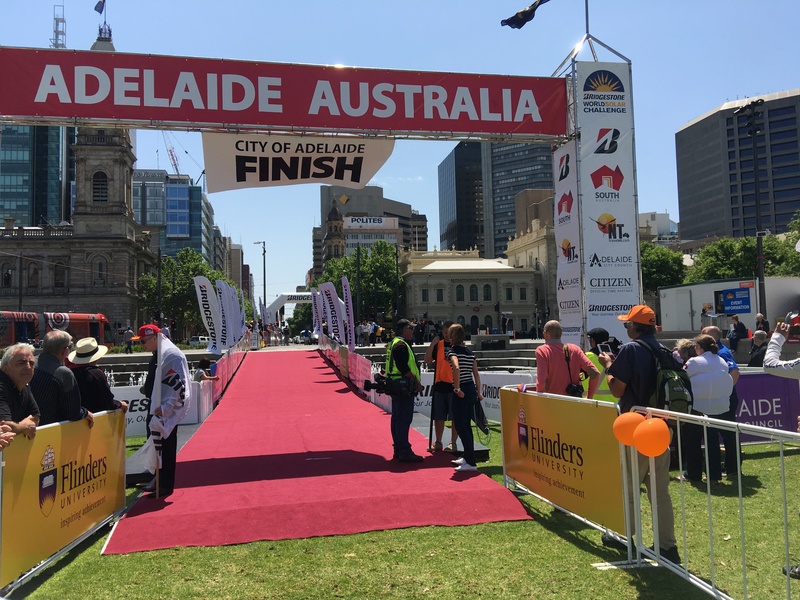 We will look forward to seeing all the teams finishing at Victoria Square at Adelaide, Australia, on Wednesday (Oct. 21, 2015) or Thursday, (Oct. 22, 2015). There is nothing as infectious as their exuberant laughter and hopping into the Victoria Square Fountain in celebrating a successful project beautifully executed. Below is the Official Announcement from World Solar Challenge 2013: FLYING DUTCH SHINE THROUGH THE CLOUDS CONTEST FOR SECOND The Nuon team from Delft University, the flying Dutch in the Netherlands claimed their title back today in the Challenger class as they crossed the finish of timing line first in the 2013 Bridgestone World Solar Challenge at 10.03 Darwin time. 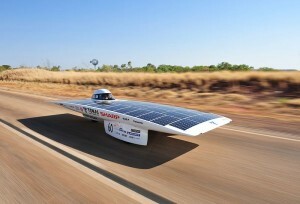 They took 33.05 hours to drive their car, Nuna 7, 3021 kilometres on solar power averaging a speed of 90.71 kilometres per hour. 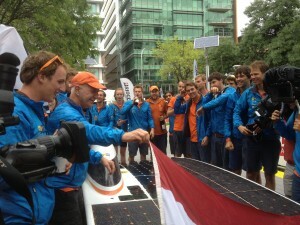 The jubilant team and support crew celebrated briefly in Angle Vale as their time was recorded before driving to the Official Finish Line in Adelaide’s Hindmarsh Square. 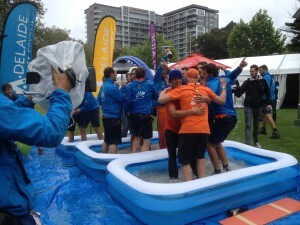 Champagne flowed as team did not let the lack of a fountain stop them from the traditional dunking synonymous with the finish line. 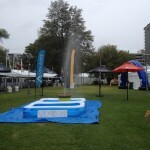 They’d organised their own wading pool to ensure the tradition continued. It was a close fought battle until the last 50 kilometres. The gallant team Tokai from Japan gave it all they had. 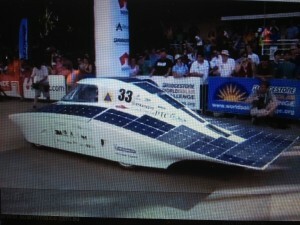 The two teams shared the final checkpoint in Port Augusta just minutes apart. But as the rain came down and the clouds rolled in it became clear the Japanese team in their solar car Tokai Challenger were not going to be able to close the gap. There was drama for Team Tokai who were forced to stop and recharge. 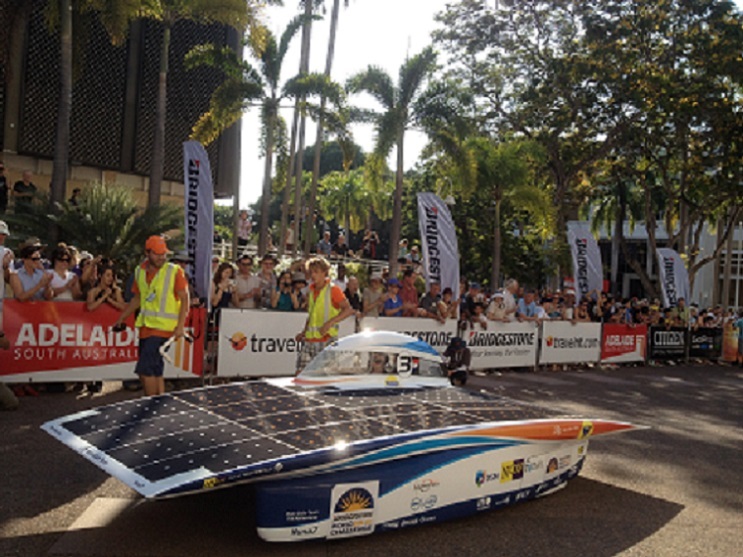 They were able to travel slowly into Angle Vale at 1.22 pm Darwin time in a time of 36.37 hours with an average speed of 82.43 kilometres per hour. 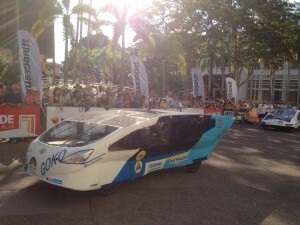 Team Tokai were not able to proceed to the Official Finish line as they did not have enough solar power to travel at a safe speed in traffic. 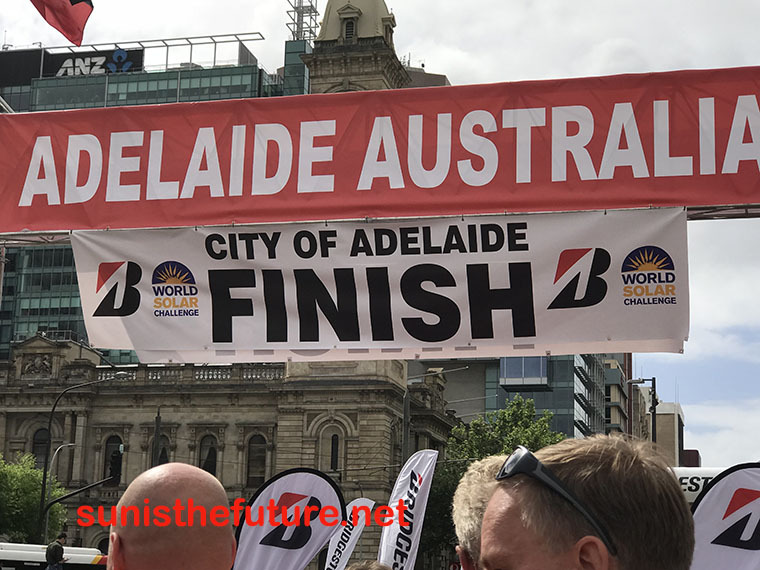 The question is now whether Team Twente from the Netherlands can reach the finish of timing and continue on to Hindmarsh Square. Stanford from the US is currently in 4th, Belgium’s Punch Powertrain is in 5th position, followed by Solar Energy Racers who are now south of Port Augusta. 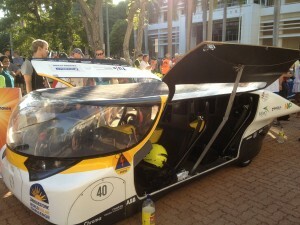 Australia’s team Arrow are in 7th position and are expected to cross the finish line around midday tomorrow. 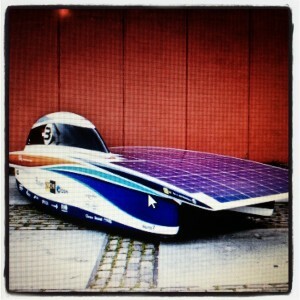 Onda Solare from Italy and Blue Sky Solar from Canada are also in top ten position and still proceeding on solar power. 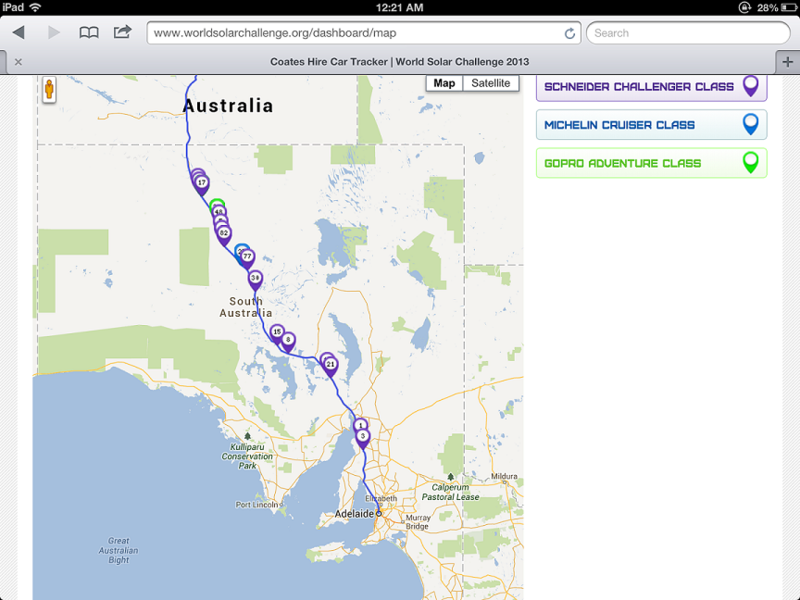 Closing the gap on the Challengers, are the Cruiser Class who left Coober Pedy this morning. 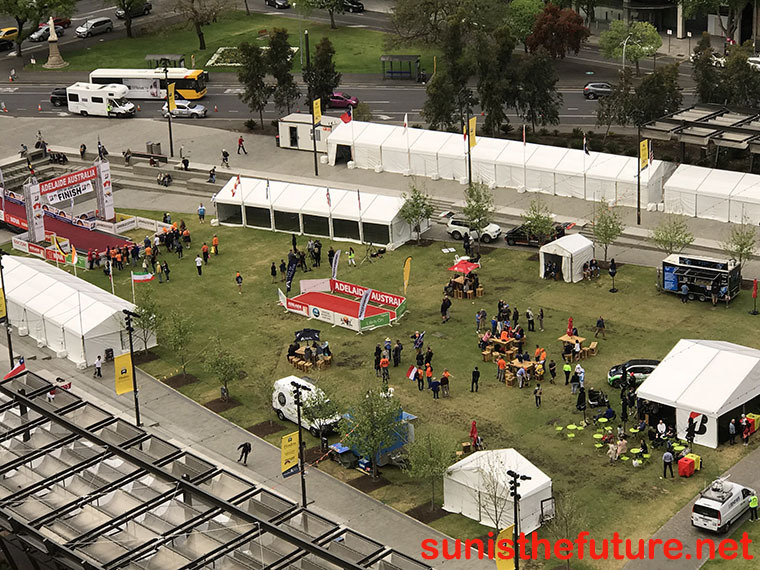 Australia’s UNSW Sunswift solar sports car eVe, is now just 50 kilometres behind Team Arrow, followed by the Hochschule Bochum team from Germany and Team Eindhoven from the Netherlands. 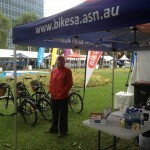 All Cruisers are expected into Adelaide tomorrow, judging will occur over the weekend. 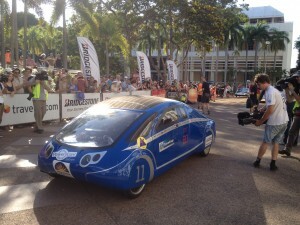 In the Adventure Class, the Aurora team from Australia continue to dominate closing on many Challenger solar cars. The stage is set for more dramas tomorrow on the final leg to Adelaide. 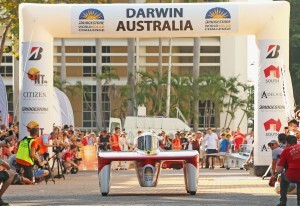 Provisional times & updates will be available following close of day five, 5pm Darwin time. 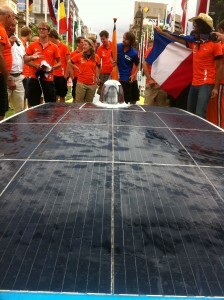 and The Red Engine of Solar Team Twente (Netherlands) being in the third place by the end of the Day4 of WSC2013. 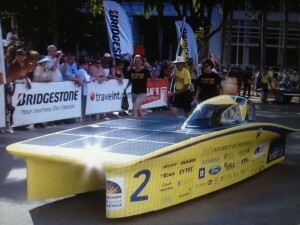 It is anticipated that the first solar car of World Solar Challenge 2013 will arrive at Hindmarsh Square of Adelaide, Australia, on Oct. 10, 2013, Day5, of the World Solar Challenge 2013. 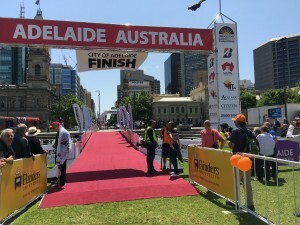 The reason the finish point of this race is not at the Victoria Square this year is because Victoria Square is undergoing beautification and will be expected to have much change in its landscape by its completion. 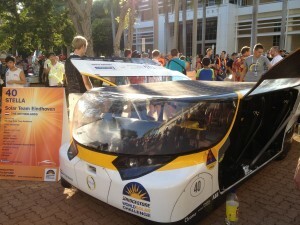 On Friday of Oct. 21, 2011, around 10:15 A.M., the enthusiastic crowd waited for arrival of Nuna 6 of Nuon Solar Team (Netherland) and Quantum of University of Michigan (USA), at the Victoria Square of Adelaide, Australia. 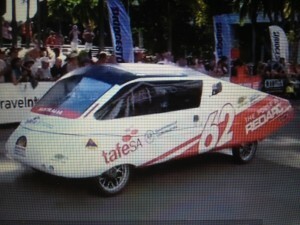 As Nuna 6 was seen coming down King William St., gradually approaching Victoria Square, the crowd no longer contains themselves and started banging on the plastic advertising bulletins… http://www.youtube.com/watch?v=mdNZei5kJmwfor they knew that Nuna 6 and Quantum had already arrived at the official finish line, Angle Vale, the day before at 2:12 P.M. and 3:55 P.M., respectively, but decided to reach for the ceremonial finish line, Victoria Square, today (Oct. 21, 2011). 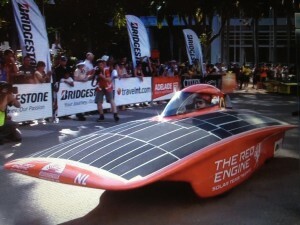 As Nuna 6 lands on the equivalent of its red carpet, but dark grey in this case, reporting crews and the crowd swarms toward this marvelous solar vehicle of reliability and efficiency. 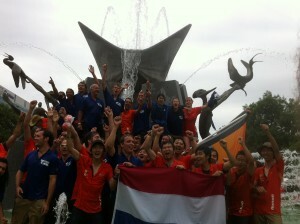 Every step of its progression reflects its vision of teamwork, from its supporting members carrying and laying down the flag of Netherland on the hood of this winning car, to the hugs and handshakes fellow team members giving to one another. 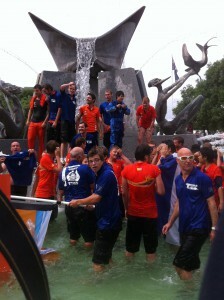 Then came the Champaign and Ritual Dip in the Victoria Fountain. 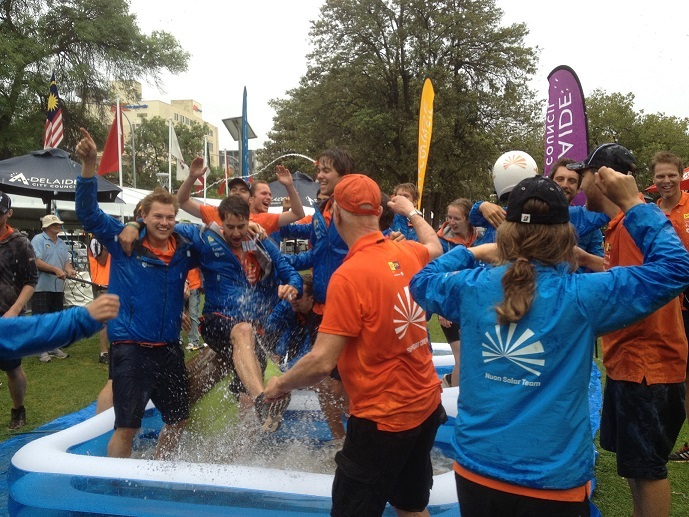 One gesture was out of the ordinary: that the Nuna 6 and Tokai Challenger 2 members started to exchange their shirts in the Victoria Fountain, symbolizing either that “we’re in this together” or “we’re all winners”. So in some of the video and photos one would find Nuon Solar Team members wearing Tokai’s blue and Tokai Challenger 2 Team members wearing Nuna’s orange. One thing to be certain, they were all having a great deal of fun, as evidenced in these photos. 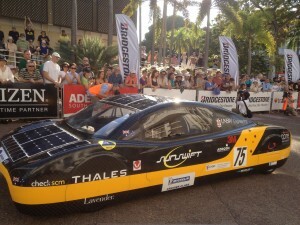 I also have uploaded an interview with one of the Nuna 6 team members/drivers above. Victoria Square is a public square in the South Australian capital of Adelaide. The square is in the centre of the city’s grid of one square mile, and was named by the Street Naming Committee on 23 May 1837 afterPrincess Victoria, heir presumptive of the British throne. A statue of Queen Victoria stands in the center of the square. 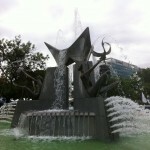 The fountain in the north of the square was designed by artist John Dowie to represent the three rivers from which Adelaide receives most of its water—the Torrens, the Onkaparinga and the Murray. Victoria Square is bordered by numerous public institutions, including the Supreme Court of South Australia, the Adelaide Magistrate’s Court, the Federal Court of Australia, theTreasury and the AdelaideGeneral Post Office. On the eastern side is the Roman Catholic Cathedral Church of St Francis Xavier and the SA WaterHeadquarters. The Torrens Building, home to a number of community organisations, is now also used by the Heinz College Australia, an international campus of Carnegie Mellon University. TheAdelaide Central Market is located to the west of the Square. King William Street passes through the square making a diamond shape with the southbound carriageway passing through the east side, and the northbound carriageway passing through the west side of the square. 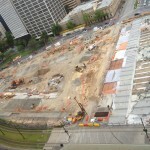 The square is bisected by a piece of road (technically part of the square) that connects Wakefield Street(entering from the east) with Grote Street (to the west). A tram stop (formerly the terminus) for the Glenelg Tram is in the southern part of the square; it was shifted from the center to the western edge of the square on 6 August 2007, as part of the extension that was made to the tram line around that time. 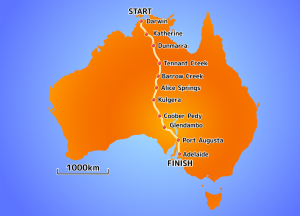 This year the Veolia World Solar Challenge will begin on October 16, 2011, from the city of Darwin , Australia, traversing the 3021 km (1,877 mi) to Adelaide through the Australian outback. spanning nine races, starting the first race in 1987. 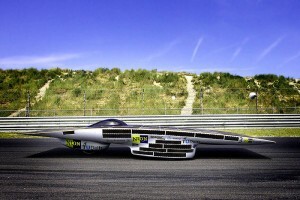 This year, the first solar racing car that departs and its support fleet will be followed at two-minute intervals by 36 other racing teams from twenty countries. 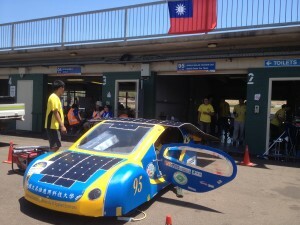 Before these solar cars are able to participate in the race, each and every one of them has to pass the qualification round of scrutineering process. 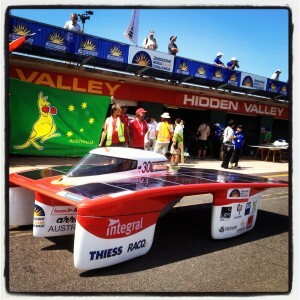 The static scrutineering process (which took place between Oct. 12, Wed.-Oct. 14, Fri) took place at Foskey Pavilion in Darwin Showgrounds, involves tests for batteries, solar cells, mechanical and electrical components, measurements and overall safety based on the rules and regulations set by the WSC (World Solar Challenge) committee. This is a very friendly competition, encouraging others attempting the same goal (utilizing the sun’s energy to power the vehicle);therefore, the scrutineering process is mainly focused on safety and protection for all involved in the process (drivers/pilots of the solar cars and people around the vehicle).The dynamic scrutineering took place on Oct. 15, Sat., at the Hidden Valley Racetrack in Darwin. 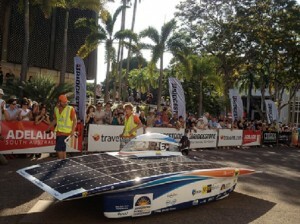 More will unfold as we continue our reporting on Veolia World Solar Challenge in the coming days….